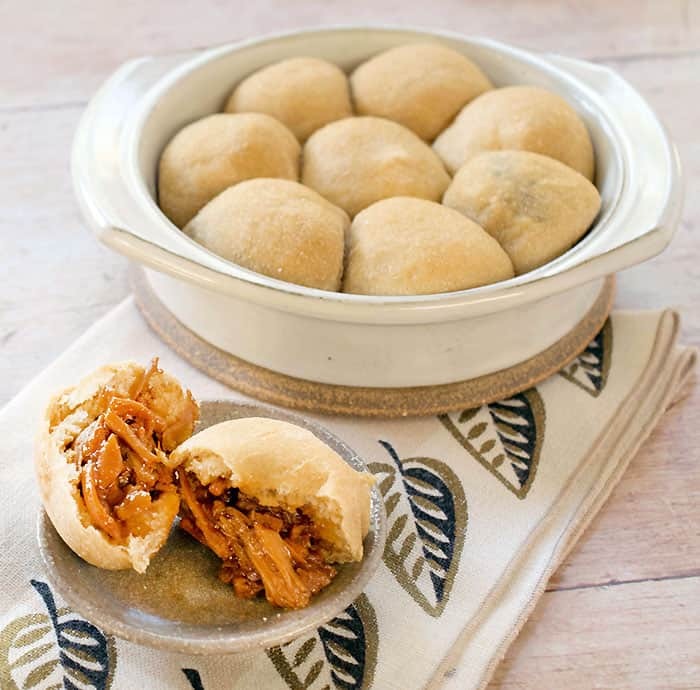 These BBQ Jackfruit Stuffed Potato Rolls are made with white whole wheat flour and gets its moisture from the lovely Idaho® Potato. Filled with a savory and toothsome jackfruit and shredded carrot bbq, these will be your new go-to party food, so make a double batch and keep some in the freezer. This is another in my series of posts sponsored by the Idaho Potato Commission. I love potatoes, don’t you? Let me know your favorite way to cook with potatoes in the comments. Make the bread dough in advance if you want, or just plan in an hour for the dough to rise. Of course, that’s a great time to prepare the bbq. Look for jackfruit in your local Asian market and make sure you get young jackfruit in brine and not the sweet canned jackfruit in syrup. You can order jackfruit on Amazon if you can’t find it locally. 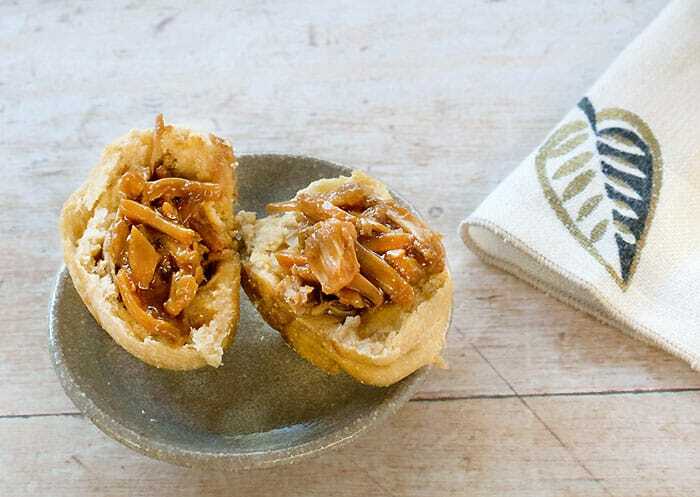 Have you already tried jackfruit? If not, it doesn’t have much of a flavor, but the texture is really what you’re after. I love making bread once the weather gets chilly. This bread is made with white whole wheat flour and gets its moisture from the lovely Idaho® Potato. Filled with a savory and toothsome jackfruit bbq, these will be your new go-to party food, so make a double batch and keep some in the freezer. What’s jackfruit? It’s actually a giant fruit that can be used unripe or ripe in foods. We are using the unripe version. While it doesn’t have a strong flavor it does resemble pulled pork or chicken in texture making it the perfect meatless choice for a pulled bbq. Note: If possible make the bbq sauce the night before to assure the filling is completely cool. Add the jackfruit to your slow cooker or a saucepan. Use your hands to shred it, breaking the solid pieces apart as best you can. Mix in the shredded carrot, bbq sauce, and water. If you are using a slow cooker, cook on low for 7 to 9 hours. For stovetop cook covered over medium heat for about 15 minutes then remove the lid and cook until the sauce is thick. Let the sauce cool completely. Add the mashed potatoes, potato cooking water, olive oil, and aquafaba in a mixing bowl or your mixer. 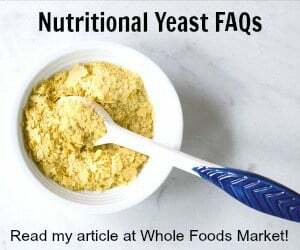 Mix well and sprinkle the yeast and sugar over the top and let it sit for 10 to 15 minutes, or until the yeast begins to foam. Mix in the flour cup by cup and add the salt with the final cup of flour. The dough should be soft, but should not stick to your hands. If it’s still sticky add more flour. Once the dough comes together either switch to the dough hook in your mixer and knead for about 10 minutes or turn out the dough onto a floured cutting board and knead until the dough begins to feel like your earlobe. Earlobe? Yes, you read that correctly. If you squeeze your earlobe it feels about the same as well kneaded dough, so it’s a great benchmark. Transfer the dough to an oiled mixing bowl and rub oil on top of the dough to keep from drying out. Cover with a clean dish towel and let it rise until it doubles in size, about 1 hour. Preheat your oven to 350°F and oil two pie pans. Roll the risen dough onto a floured cutting board and cut into 16 equal pieces. Roll each one into a ball. Spread a bit of flour onto work surface and pat the circle in it. Turn the disk over and pat again. This should give you a pretty even circle, but you can use a rolling pin if you find that easier. Do not roll thin or your filling will burst out while cooking. Take 3 tablespoons of cooled bbq filling, place in the center of the dough round, and carefully pull up the edges to meet. Pinch to seal the edges. Hint: if your hands get wet or the edges get coated with the bbq sauce it will not seal well. Place the filled roll in one of the prepared pans, then repeat until all the rolls are filled and in the prepared pans. Brush the tops with olive oil. Bake for 20 to 30 minutes, or until the tops are browned and firm to the touch. 14 Vegan Recipes to Turn Fresh Corn into Amazing Summer Meals! Oh YUM! 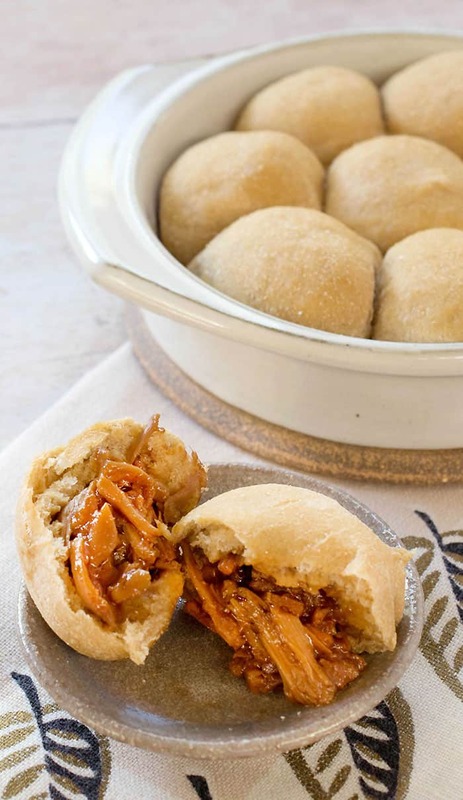 I love BBQ jackfruit and potato rolls – why have I never put the two together?? Such a delicious idea! These look amazing! 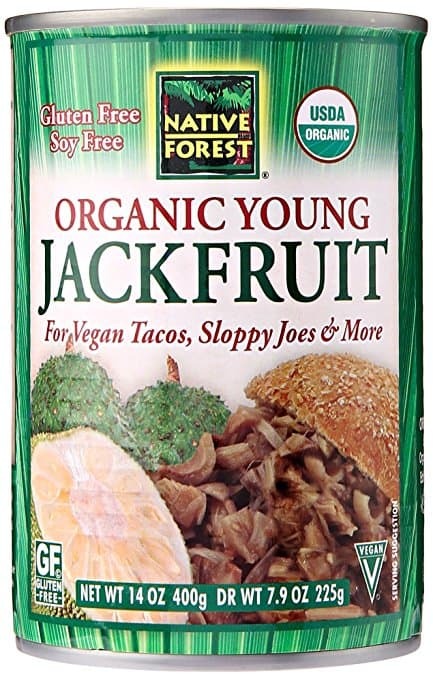 I’m always looking for fun ways to cook with jackfruit – there are only so many bbq jack sandwiches I can make! Will these work without the oil? They should work fine. Just use extra aquafaba or unsweetened plain nondairy milk.